Throughout the long history of American slavery, black people understood their society in the idiom of kinship. African-American families transmitted their culture from the Old World to the New, socialized the young and succored the old, buffered relations between master and slave, and served as an engine of resistance to an oppressive regime. Emancipation at once strengthened and transformed the families of former slaves. As African Americans reconstituted their domestic life on a foundation of freedom, previously hidden beliefs came into full view and familiar usages took on new meaning. 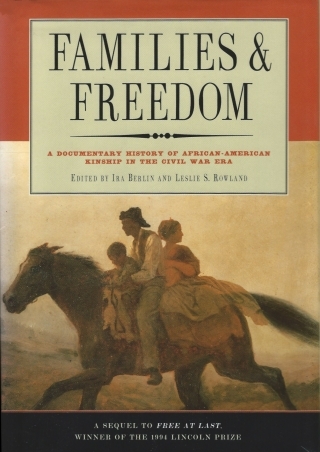 Families and Freedom tells the story of the remaking of the black family during the tumultuous years of the Civil War and early Reconstruction. In the words of former slaves, free blacks, and their contemporaries, it recounts the elation accompanying the reunion of brothers and sisters separated for half a lifetime and the anguished realization that time lost could never be reclaimed; the quiet satisfaction of legitimating a marriage once denied at law and the sadness of discovering that a long-lost spouse had remarried; the pride of establishing an independent household and the pain of being unable to protect it; the hope that freedom would ensure the sanctity of family life and the fear that the new order would betray freedom's greatest promise. The documents in Families and Freedom provide insight into the most intimate aspects of the transformation of slaves to free people. Available in paperback and suitable for classroom use, Families and Freedom includes photographs and other illustrations. Copies of Families and Freedom may be purchased from The New Press online, by telephone (800-233-4830), or by fax (212-629-8617). For John Boston, the triumph of his own escape to freedom within Union lines was tainted by the resulting separation from his wife. Captain Charles B. Wilder explained how fugitive slaves, once having escaped to Union lines, worked to liberate fellow slaves and spread the word of freedom deep in Confederate territory. Shortly after the battle of Fort Wagner, South Carolina, a free-black woman whose son was serving in the 54th Massachusetts Infantry advised President Abraham Lincoln of his responsibility to prevent the Confederates from enslaving captured black soldiers. The marriage of two former slaves, Private Rufus Wright and Elisabeth Turner, was presided over by a black army chaplain, the Reverend Henry M. Turner. Martha Glover of Missouri, who remained enslaved after her husband enlisted in the Union army, described to him the burdens she and their children had subsequently borne. The wife of a slave who had enlisted in the Union army warned her husband against sending money in the care of her owner, in whose custody she remained, for fear he would intercept it. Lieutenant William P. Deming relayed to General William A. Pile his men's complaints that slaveowners were punishing their wives and children by assigning them heavy work normally done by the men. 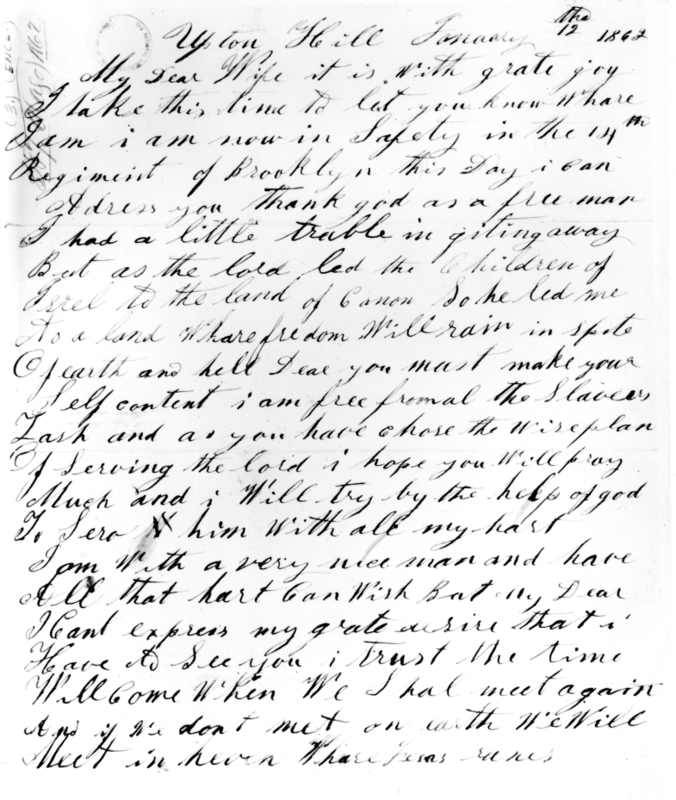 In letters to his wife, a black soldier not only described a battle in which his regiment participated but also passed along more mundane news. A black soldier from Maryland consoled the mother of a friend who had died in combat. Maryland's exclusion from the Emancipation Proclamation left Annie Davis still a slave. Insistent on her right to freedom, she demanded that President Abraham Lincoln himself clarify her status. When a group of ex-slave men working as Union military laborers returned home to liberate families and friends, they were accompanied by a detachment of black soldiers, whose brigade commander reported the outcome of the expedition. Private Spotswood Rice promised his daughters – and warned the woman who owned one of them – that their liberation was at hand. Freed by the adoption of a new state constitution that abolished slavery, Jane Kamper confronted her former owner, who attempted to keep her children under his control by having them apprenticed to him. 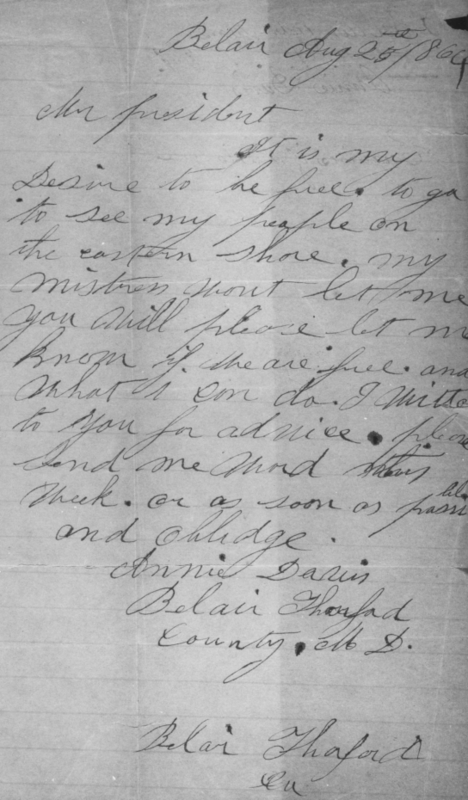 Apprehensive about her son's safety as well as her own welfare, the elderly mother of a black soldier petitioned President Lincoln for his release from further service, on the grounds that he was her sole support. Threatened by their owner, the wife and children of Joseph Miller had accompanied him when he enlisted in the Union army. Miller described the ordeal that followed the expulsion of his family from the camp in which they took refuge. A black soldier unsuccessfully sought a discharge so that he could provide for his wife and children, whose owner would not maintain them. A black soldier at Camp Nelson, Kentucky, protested the expulsion of his wife and ailing daughter from the camp, where they had taken refuge after being threatened by their owner. Immediately after Maryland abolished slavery in November 1864, former slaveholders in the state rushed to apprentice ex-slave children in order to keep them in custody and control their labor. General Henry H. Lockwood reported how the apprenticeship system system worked and to whose benefit. Private Aaron Oats believed that his service to the Union entitled him to assistance in liberating his family. In a letter to the secretary of war, Oats enclosed two letters he had received, one from his wife and the other from her owner. 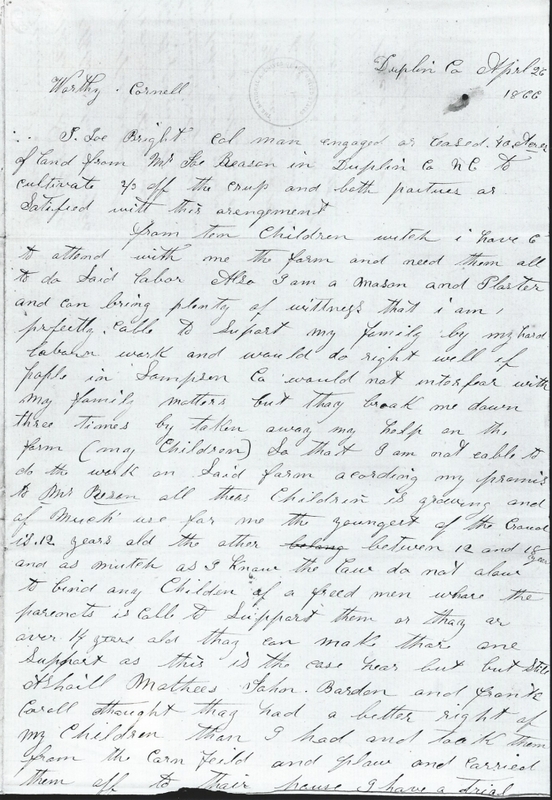 The chaplain of a black regiment in Arkansas confirmed the importance of marriage to the freedpeople and described their conviction that wartime emancipation was less an end than a beginning. After her husband enlisted in the Union army in late 1864, Patsy Leach endured abuse at the hands of their enraged owner, a Confederate sympathizer in Kentucky. Fearing for her life, she fled with her youngest child, leaving four other children behind. When Congress adopted a joint resolution in March 1865 freeing the wife, children, and mother of every black soldier, slave men in Kentucky (where slavery remained legal) responded with a renewed surge of enlistments. Slaveowners threatened volunteers and their families with violence, and local police and slave patrols tried to obstruct slaves' flight to recruitment centers. A soldier recounted how he and his wife had been foiled in their first attempt to escape. 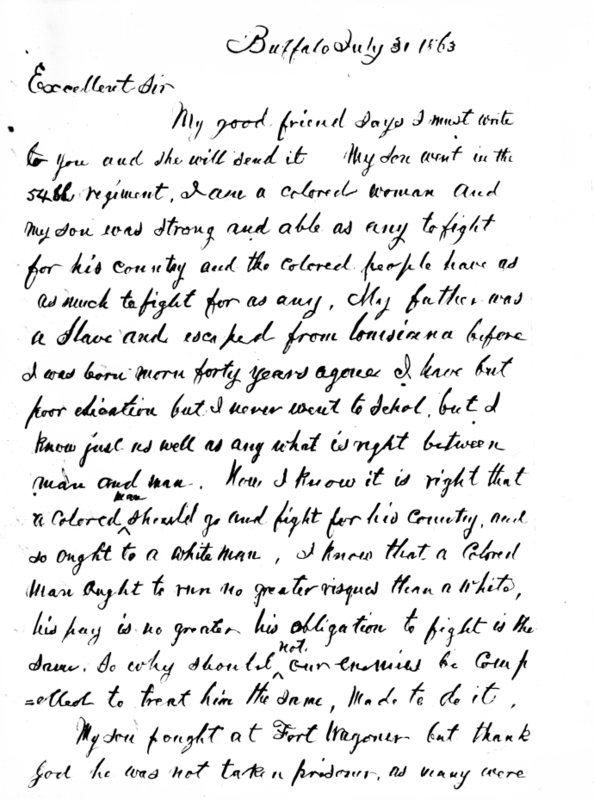 At the end of the war, black soldiers stationed near Petersburg, Virginia, wrote to the commissioner of the Freedmen's Bureau to protest the suffering of their wives, children, and parents at a settlement on Roanoke Island, North Carolina. More than a year after his death in battle, the widow of a black soldier sought to recover the pay due him. Attempting to reunite with his wife and children, John Berry was forcibly turned away by their former owner, who was embittered by Berry's service in the war against the Confederacy. Armed with an order from General John M. Palmer, the military commander in Kentucky, a black sergeant attempted to move his wife from the home of her former owner, only to be jailed by civil authorities. His company commander recounted the episode to the commander of the regiment, whose endorsement and that of General Palmer indicated that such persecution of black soldiers was common. When the circumstances of their households allowed, many freedwomen declined to labor for white employers, preferring to care for their children and engage in productive activities in their own housholds, gardens, and poultry yards. A planter in Georgia denounced this reduction in the plantation labor force as detrimental to entire Southern social order. For impoverished black Southerners struggling to attain economic economic, their primary resource was the labor of their families. Joe Bright rented a forty-acre farm, expecting his six working-aged children to help him cultivate it, but his expectations were dashed when their former owner had the children bound to him as apprentices. Stationed in eastern Arkansas, where many of them had been enslaved, soldiers of the 56th U.S. Colored Infantry expended both their money and their labor to construct an orphanage for black children. Part of the History Department of the University of Maryland, the Freedmen and Southern Society Project is supported by the university and by grants from the National Endowment for the Humanities and the National Historical Publications and Records Commission.